Liv is 22 and a media student and part time nanny in London. She has a wardrobe full of clothes that don’t fit her anymore and she would love to be able to get back into them – as a student, she can’t afford to buy new ones! She does admit she is a lazy cook with pasta in tomato sauce being one of her staples. She also loves pre-bought mash with tomato sauce and cheese mixed into it! Another favourite is a Chilli Con Carne ready-meal. When she does cook, her signature dish is a stir fry chicken curry but, she does use full fat coconut milk in it. That said, it is a hit with her friends and she tends to cook it whenever they come over. Liv’s weight does really fluctuate and she can usually shed a few pounds for the summer. Like most of us, she does tend to be a bit heavier in the winter. She used to be skinny but has been diagnosed with Type 1 Diabetes which makes it all the more difficult. Liv said that if she’s had a bad day, she would probably have a couple of handfuls and, she admits, that her hands aren’t small! Gizzi asked her if she cooked. She said she did, if she had the time and the ingredients. But she did admit to Gizzi she could be quite lazy about food shopping. Gizzi then told Liv she was going to have a quick look round her kitchen to see what she could find. Liv did look a little worried! The first stop was the fridge which Gizzi said was quite bare but, one thing the fridge was well stocked with was those nasty ready meals! One of the ready meals was Liv’s beloved Chilli Con Carne. Aside from ready meals, Liv does like to keep her food shop down to a minimum so the fridge was quite empty and Gizzi said there wasn’t much to talk about in it. The first thing for Gizzi to tackle was Liv’s snacking habits. 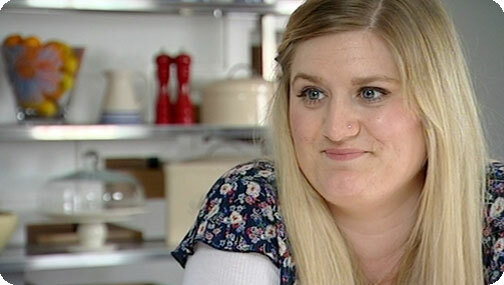 Liv’s sweetie jar contains a jaw-dropping 12,796 calories! Gizzi told Liv she was going to make her some strawberry and cream cupcakes. Liv seemed very happy with that – she said she LOVED cupcakes! But, as always, these cup cakes had a couple of hidden surprises! Normal icing is made from lots and lots of butter. Meringue icing uses just egg whites and a little bit of sugar. On top of the meringue icing, Gizzi placed a fresh strawberry. The finished article looked very yummy! Liv’s Sweetie Jar portion comes in at 417 calories. 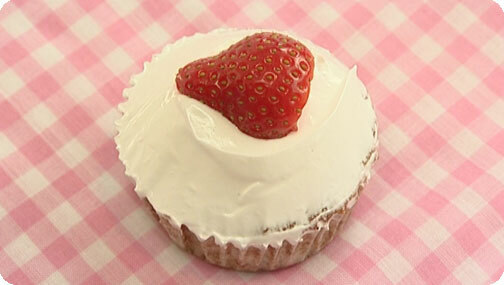 Gizzi’s Strawberries and Cream Cupcakes come in at just 194 calories per cake. Less than half! As Liv is a student and a part time nanny, she already leads an active life. But, she can fit a little bit more exercise in to help her with the battle of the bulge and she wouldn’t have to change her routine. If she was to pack her books into a rucksack and then replace her walk to University with a run, she could burn off 246 calories. If she only did that once a week, she could burn half a stone in a year! Gizzi told Liv she was going to show her how she should be eating Chilli rather than pricking the plastic, bunging it in the microwave and eating it out of the carton! While Gizzi was cooking the sauce and meat, she told Liv that the amount she was cooking would serve six people so, she could portion it up and freeze it and have her own, home-made ready meals to just heat up when she was in a hurry. Gizzi cooked the meat with the spices and then popped it all into the oven for two and a half hours to make sure the meat had got to the ‘shredable’ point. She then went on to make some fresh guacamole. Guacamole is made from avocados which are notoriously quite fatty and high in calories but, they are sooooooo good for you. They are, in fact, a ‘Super-food’. 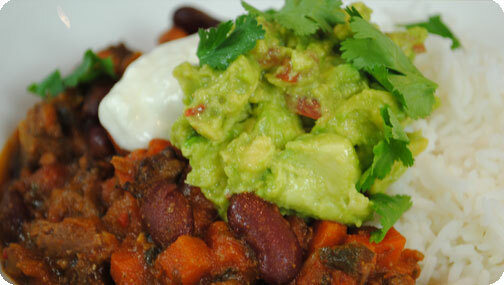 The chunky chilli was served with basmati rice, a dollop of guacamole and a dollop of soured cream. It looked amazing! Yuuuuummmmmmm! Liv’s Microwave Chilli Con Carne stomps in at 540 calories per portion. Gizzi’s Chunky Chilli Con Carne steps in at just 483 calories per portion and that’s with the added guacamole and sour cream! Without the guacamole and soured cream, it would be a mere 401 calories. Liv’s last downfall dish is one she cooks herself when her friends come over to visit – stir fry chicken curry. But when she cooks it, the amount of oil she uses makes it look like it is deep fried AND she uses full fat coconut milk! Gizzi told her she was going to show her a way that she could have stir fried curry and be super-full but without the fat with her Spicy Stir Fried Singapore Noodles. Because everything is cooked hot and fast, all the ingredients need to be prepared before you start cooking. Liv’s curry had just one chicken breast but, because Gizzi’s is so low fat it had prawns, chicken and bacon in it. To start cooking, all Gizzi used was a teaspoon of oil! Liv’s Chicken Stir Fry Curry has a whopping 88 grams of fat per portion. 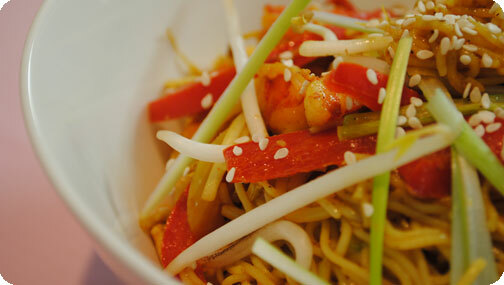 Gizzi’s Spicy Stir Fried Singapore Noodles has just 5 grams of fat per portion. 17 times less fat – wow! Gizzi then told Liv she had a gift for her. She gave Liv a wok to help her carry on cooking for herself instead of using bland, tasteless ready meals. And it was a non-stick one so it means Liv only needs to use a tiny amount of oil when she’s cooking. If Liv swaps her dishes for the new recipes that Gizzi has given her and runs once a week, she could lose three stone in six months! Now that is how you cook yourself thin!